Mama Miti by Donna Jo Napoli—inspired by Wangari Maathai’s true story, this reads like a beautiful folk tale of wisdom, ancient knowledge and the power of trees (Simon & Schuster; ISBN 978-1416-935056). Holland: A Thousand Things about Holland (set of two books) by Charlotte Dematons—this is really two books in one. The hardcover book has large, detailed illustrations of all things Dutch; the accompanying softcover book contains historic facts, little tidbits of “I never knew that!”, gems of tradition and much more. This is a must-read for anyone who has ever been to The Netherlands or who dreams of visiting that country (ISBN 978-1935954286). Over on a Mountain by Marianne Berkes, illustrated by Jill Dubin—Written in the same format of rhyme and rhythm Ms. Berkes uses in books like Over in the Ocean, this picturebook tells the story of animals who live in mountain ranges around the world. Lovely illustrations in paper collage add details and intrigue but also offer hidden animals to search for. More information about the animals and their habitat is shared in the back, together with classroom activities for those extra-motivated readers (Dawn Publications; ISBN 978-1-58469-519-6). Not a Chance by Michelle Mulder—this is a good story of a teenager whose parents spend the summer working in the Dominican Republic. Dian has to come along, even though she would rather stay home in Canada. Cultural differences are woven in throughout the story, making for a fascinating read for ages 9 to 12 (Orca Books; ISBN 9781459802162). Brilliant!, The Story of Sustainable Energy by the same author (Michelle Mulder), is a great nonfiction book on unusual methods people around the world use to create energy: “Did you know that cars can run on French fry grease and that human poop can be used to provide power to classrooms?” The book shares information on children in Mexico who generate light by playing soccer, and how soft drink bottles can be used as ceiling lights (Orca Footprints; ISBN 978-1-4598-0221-6). 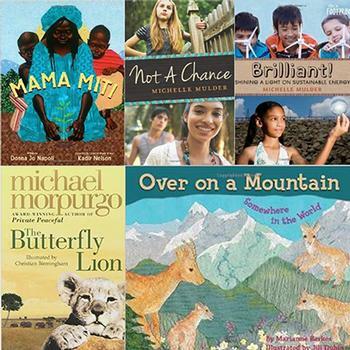 The Butterfly Lion by Michael Morpurgo has been around for a while (first published in 1996). I was drawn to the cover, with a lovely lion cub and elephants in the background; it is the unusual tale of a young boy who has to leave his beloved Africa to live in foggy England. Bertie is lost and lonely at boarding school, but an unusual friendship and a powerful story help him cope with his new life. A great book for read aloud in the upper primary or middle school classroom (HarperCollins; ISBN 978-0-00-675103-8). Margriet Ruurs’ newest book is A Brush Full of Colour: The World of Ted Harrison. She conducts author presentations in international schools around the world. Visit http://www.margrietruurs.com.